anastronaut: What's a nonlinear adventure game? When adventure games first started, solving puzzles was restricted. For example, to open a locked door you must have a key. The game won't proceed unless you open that door. Later on, adventure games got a little alternative ways to solve puzzles. So now you can either find a key to open the door, cast a magic spell, or even pick the lock and open the door. Still, the game won't proceed unless you open that door. Figure 1 illustrates the straight forward puzzle solve. Your goal is to get to the orange circle starting from the purple one on top. You do a couple of interactions, then an event gets triggered allowing you to perform one last interaction that would lead you to your goal. However, in figure 2 you get a choice in the process of getting to your goal. After performing one interaction, you can either do one of two tasks, one would lead to the failure of getting to your goal (usually death) and another that allows you to proceed and solve the puzzle. This appears more sophisticated in a flow chart while in reality it is still considered straight forward. Because being stuck figuring out a single task to perform in order to proceed the game is equivalent to dying, at least for me. 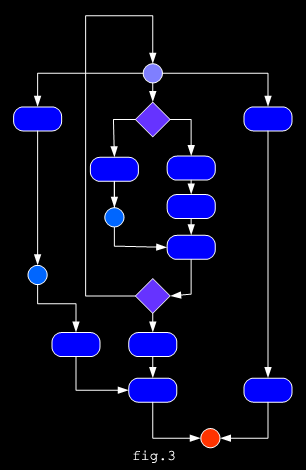 Figure 3 illustrates Epoch's approach to a nonlinear adventure game. Starting from the purple circle at the top, you get three branches to go through. The left branch triggers an event and then leads to the goal. This branch is made short and easy intentionally, as for later as a punishment, the triggered event would make it a little harder to solve a future puzzle. The middle branch starts with a choice, the easy way triggers a 'punishment' event and the hard way doesn't. Then you get to a fork where you are asked if a previous puzzle was completed, if not you'd have to get back solving the previous puzzle or take another branch all at free will. If the previous puzzle was already solved then you would continue to your goal free of punishment. The branch on the right is a very tricky one, in the figure it seems as if it's the easiest way. In reality it depends on high skills of the player. For instance, if the task is picking a lock and the player knows how to pick locks in real life then this is the branch for you. Or if the player is good at aiming, has quick response time and so on, then these physical skills get to the goal with less trouble what's so ever. Figure 3 is an actual illustration to obtain an inventory item to perform a specific task in Epoch. To add more depth and free will, the whole task has an alternative solution as well.